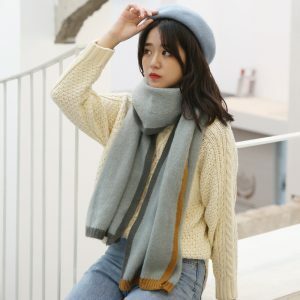 FEATURES This scarf is made of pure natural vegetable dyes, colorless and odorless, safe and non-toxic, healthy and environmentally friendly. The advanced dyeing process makes the scarf look more shiny and the color is more pure and natural. With solid color treatment, the color is firmer and more washable. 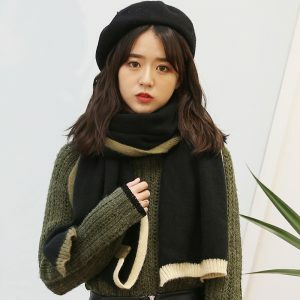 Pure wool fabric, good breathability, smoother and softer feel, comfortable to wear and warm. The fabric is crisp, naturally drooping, and the version is good. It is not easy to be deformed after repeated cleaning and is durable. The weaving process is fine, the wire is fine, and the needle is not off-line. The contrast color design adds vitality to the scarf.